Volume 7 short story: Make a show of gratitude every now and then! Make a show of gratitude every now and then! The first thing I said after returning to the mansion made Darkness who was walking around in a skimpy attire freeze. After hearing our exchange, the jaw of Megumin who was playing a board game with Aqua dropped. I took a glance at Megumin. Megumin said in a panic while Aqua sat before her with her arm crossed and nodded. That’s right. Wiz asked me to test out this new magic item. When Wiz in her skimpy summer dress asked me with upturned eyes, I happily accepted it. On my head right now was a hat handed to me by Wiz. “E-Erm, I wasn’t asking why you accepted… No, that was just your thoughts leaking out. But why’d Wiz make such a magic item…? I looked at Aqua who was still motionless, focusing on the board game before her. I took off the hat and placed it on her head. When the voice of Aqua came out from the top of her head, Megumin pounced on her straight away. I gently removed the hat from Aqua and put it on. 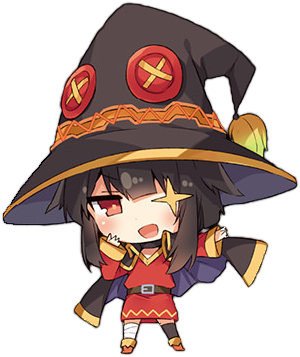 After seeing Darkness’s reaction, Megumin sighed. I took off the hat, lazily stretched my back and walked to the kitchen. I turned and looked at the hat in surprise because of the sudden voice. At this moment, Aqua’s cries came from the living room. … They were really troublesome. ‹ PreviousVolume 8 Short story: To realize a man’s romance! I’m surprised the hat worked at all when placed on Aqua’s head. Why do I feel that the ghost girl follows Kazuma around when he’s at home? Ghost girl x kazuma confirmed? I’m fine with it I’ll just take megumin for myself then.